Poha Namkeen is tasty and can also be easily prepared at home. Make Poha Chivda Namkeen and store, you can eat it anytime with tea or give it to your kids if they are a little hungry, they will surely love it. 1. 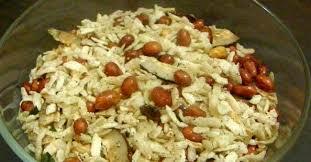 You can deep fry the Namkeen, if you want to make Namkeen by frying Poha then it is better to use fat grains of Poha. 2. You can also shallow fry Poha and prepare the Namkeen, you should use thin grains of Poha for this. Pour oil in a frying pan(kadhai) and heat, put almost half of the Poha in hot oil, lower the flame. Stir fry Poha till they double in size but their color remains the same. Take out fried Poha and keep them in a strainer to remove excess oil. Similarly fry the remaining Poha.